Tektronix Entry Level TBS1000 Oscilloscope Series, giving electrical engineers, educators and hobbyist an affordable, dependable and full-featured tool for a wide variety of general purpose electronics test applications. 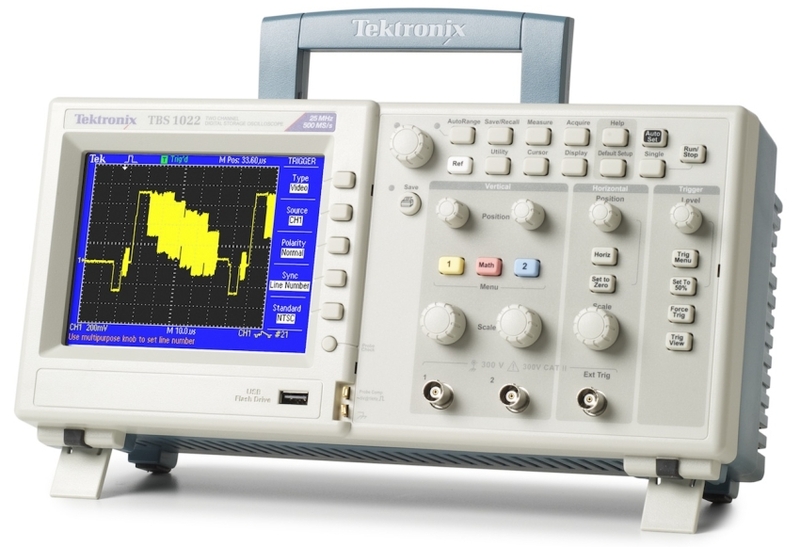 With prices starting at just $520, the TBS1000 Series (for Tektronix Basic Scope) makes it easier than ever for educators to put an oscilloscope on every desktop, for hobbyists and tinkerers to enjoy Tektronix reliability and performance, or for companies to outfit their entire engineering and technical support teams with the powerful diagnostic tools they need. Designed and manufactured by Tektronix, and backed by a 5-year warranty, the new oscilloscopes deliver excellent performance and accuracy with 1 GS/s or 500 MS/s sample rates and 3 percent DC gain accuracy down to 2 mV. Compared to the previous TDS1000-EDU Series of oscilloscopes, the TBS1000 Series offers more bandwidth alternatives including new 25 MHz and 150 MHz models. A new waveform data logging feature allows users to save up to eight hours of triggered waveforms to a USB flash drive. Another enhancement is waveform limit testing that allows users to monitor signal changes and output pass/fail results. The TBS1000 is based on the same proprietary technology as the extremely popular TDS2000 Series, and includes the same versatile triggering, automatic measurements, USB connectivity, and FFT capability. Taken together the TBS1000 Series delivers an unbeatable combination of superior performance, unmatched ease-of-use, and affordability in an ultra-lightweight, portable package. A particular strong suit for the TBS1000 Series is usability. The user interface offers intuitive operation familiar to engineers around the world, coupled with a full set of the most frequently used measurement types and analysis functions. Usability is further enhanced with a lightweight, compact design. To meet the needs of educators, each TBS1000 oscilloscope includes an Education Resource CD offering a broad range of lab exercises, instructor’s guides and primers that cover the use of oscilloscopes and probes. The TBS1000 Series oscilloscopes are available now. Prices range from $520 for a two-channel 25 MHz instrument to $1,520 for a two-channel 150 MHz model. For more than sixty-five years, engineers have turned to Tektronix for test, measurement and monitoring solutions to solve design challenges, improve productivity and dramatically reduce time to market.